Add pancetta and cook until browned. Add onion, celery, carrots and continue cooking about 5 minutes. Add beef, salt, pepper, and nutmeg. Cook until meat loses its pink color. Add wine and cook until all the wine has evaporated. Blend in tomato paste. Reduce to a simmer and cook uncovered for 30 minutes. Remove from heat. Combine all ingredients and knead until smooth. Roll out with a pasta machine or on a lightly floured surface to 1/8-inch thickness. Cut into 6-inch squares. Re-rolling scraps to get additional squares. Whisk in flour and cook 3-4 minutes until lightly golden. Slowly whisk in hot milk, blending until smooth. Add salt and nutmeg. Reduce heat to low and cook 10 minutes. 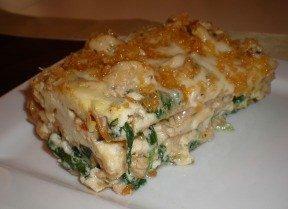 Cook lasagna squares in salted boiling water for 1 minute. Drain and rinse. Lay on dish towels. Preheat oven to 350 degrees F. Butter a 9 x 13-inch baking dish. 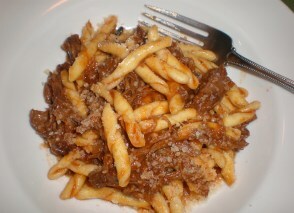 Arrange a layer of pasta in dish. 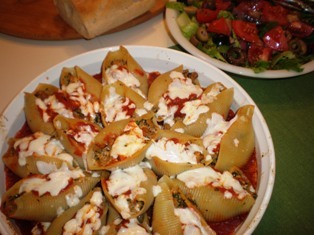 Spread 1/3 each of Béchamel sauce, Bolognese sauce, and Parmesan on top. Repeat layers 2 more times. Dot top with butter. Bake until hot and bubbly, about 40 minutes. 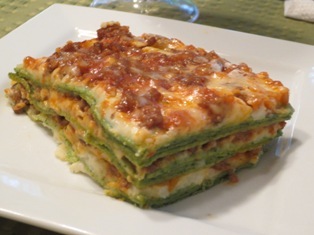 Lasagna Verde alla Bolognese combines layers of fresh spinach pasta with the creamy texture of bechamel, and the rich, meaty flavor of Bolognese sauce. This classic Italian recipe from Emilia-Romagna does takes some time to make but the result is an extraordinary lasagna that is sure to impress your guests. You can use dried spinach lasagna pasta (cooked) in place of the fresh but making it with fresh pasta makes it so much better. This carrier is designed to fit most 9" x 13" baking dishes and keeps food hot or cold for hours!